Ganagitti Temple in Hampi is a Jain temple. It is located on the Kampli road, on the way to Bhima’s Gate. This lovely temple is one of the simple stone structures in Hampi. 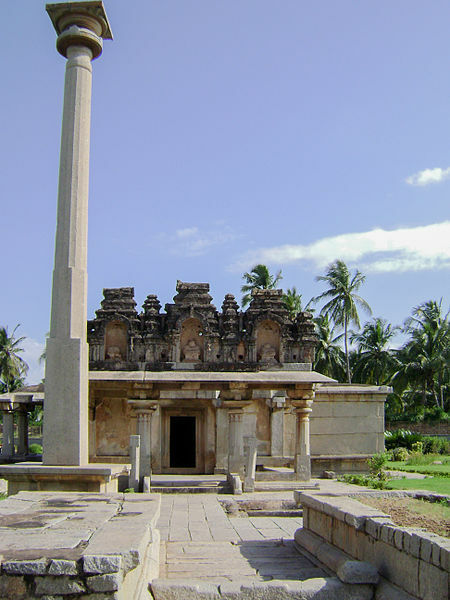 The temple is one of the earliest structures constructed during the reign of the Vijayanagara Empire. It is one of the notable temples in the ancient village and is visited by a large number of tourists on their Hampi trail. The Ganagitti Temple was built by Iruguppa Daṇḍanāyaka (also known as Iruga), the minister of Bukkarāya II, during the reign of the Vijayanagara king Harihara II. It was consecrated in the year 1386 AD. The temple is dedicated to Kunthunatha, the 17th Thirthankara of the Jaina faith. The temple is also known as Kunthunatha Jaina Temple. It is one of the main Jain or Jina temples built during the reign of the Vijayanagara Empire in Hampi. The temple is also known by other names such as ‘The Oil-Woman Temple’ and the Ganigitti Temple. The Ganagitti Temple is a lovely structure with a simple form and design. Though the temple is built in the Vijayanagara style of architecture, it has some design elements that are derived from the temples of the late Chalukya era. Jain temples are normally very simple in architecture. The Ganagitti Temple follows the same principle in terms of simplicity. The temple has two halls and an inner sanctum. The two halls are called the antarala ardha mantapa and maha mantapa and the inner sanctum is the garbha griha of the temple. The Ganagitti temple once had an idol. Though the idol is longer there, the stone pedestal on which the idol once stood can still be found there. The temple also has foot marks on the platforms built inside it. These foot marks are believed to be of Thirthankara. The temple has several Jain sculptures that can be found in various parts of the structure. The superstructure of this temple in Hampi is made of stone. The superstructure is built in the form of a stepped pyramid that has six diminishing talas of plain horizontal slabs. A huge mana-stambha or column stands near the portico of the temple. An inscription found on the column states the name of Iruguppa Daṇḍanāyaka as the person who constructed the temple during the reign of Harihara II. Unlike most structures and temples in Hampi, the Ganagitti Temple managed to escape destruction. This ancient temple, existing from the early days of the Vijayanagara rule, is one of the few well preserved temples in Hampi. It has managed to stand the test of time and weather throughout all these centuries. Even today it is in a good condition. The Ganagitti Temple in Hampi is situated on the way from Kamalapuram to Anegundi. The place is easily accessible to visitors once they reach Hampi. Hampi is a ruined old village with no airport of its own. Ballari (Bellary) the closest town that has an airport. Ballary stands at a distance of around 64 km from Hampi. Visitors can reach Ballari by flight and then travel to Hampi by means of local transport. The village of Hampi is devoid of a railway station. The nearest railway station can be found in the city of Hosapete (Hospet). It has the Hospet Junction Railway Station. Hosapete is situated at a distance of around 10 km from Hampi. One of the easiest ways to reach Hampi from Hosapete is to take a bus. There are other means of local transport also to reach Hampi from Hosapete. Hampi has a good road network and is connected to many towns and cities by this network. There are a lot of buses that travel between Hampi and several towns and cities in Karnataka. Visitors have the option to hire private cars, cabs or other vehicles from big cities like Bengaluru (Bangalore) or Mysuru (Mysore) to travel to Hampi.